Doctor, writer, and world traveler; lover of politics, movies, and advocacy through storytelling. Unrest continued to spread in Charlotte after the shooting of Keith Lamont Scott and the release of videos showing the exchange with police that lead to his death. Every weekend, as the NFL and college football seasons continue, many watch as athletes, following the lead of Colin Kaepernick, take a knee during the national anthem. On Saturday, Sept. 24th a section of Carolina students at the Pitt vs. UNC football game sat during the national anthem, some with raised fists, to add their voice to the national outcry against police brutality and racial profiling that was now raging in a major city in North Carolina, only a couple hours away from their idyllic campus. It unearths a complicated issue, which tripped up Supreme Court Justice Ruth Bader Ginsberg as she called Kaepernick's approach "dumb and disrespectful," and our own famed basketball coach Roy Williams has finally warmed to, yet East Carolina University band members are facing a different response for their participation. Now before people get upset, and start stripping the students of their patriotism -- this is a teaching moment. In case you didn't know, let me tell you a bit about the University of North Carolina at Chapel Hill, my alma mater. UNC-Chapel Hill has a rich legacy known for student self-governance and activism. It is something that has been as consistent and as stable of a fixture as college basketball dominance, our rivalry with Duke, and Carolina blue skies. Years ago, when I was an undergraduate, a diverse group of students started a movement which later led to the renaming of Saunders Hall, a building once named after a chief organizer of the Ku Klux Klan in North Carolina, a goal championed by generations of Carolina students. This also resulted in the early steps of the University acknowledging its complicated history with slavery and those people of color who built UNC into the institution it is today. It was also clear when we took a stand to join our fellow Muslim students in support as they and their families endured backlash after the September 11th terrorist attacks. Activism is a tradition that was clear long before I walked through campus as Student Body President in 2002, and was clear again last weekend when those students chose to demonstrate during the national anthem. Nestled in the heart of a gorgeous state, that is the amalgam of Southern heritage, hospitality, and the respect and beliefs of showing decency to your fellow man. Every town I have visited from the mountains in the west, to the beautiful beaches of the coast have introduced me to the sweetness and wonderful character of one of the most incredible states in this country. So imagine my dismay as tragedy made its way to Charlotte, awash in anguish and mostly peaceful protest in response to yet another shooting resulting in the questionable use of lethal force by police, and the death of a black man. However, imagine my pride when reading about the actions of these brave students who represented something greater than themselves. So when fellow classmates and past alumni started online outreach through Facebook to show our support, it only felt right to follow the example of these students and respond amidst an act that some have deemed unfavorable. 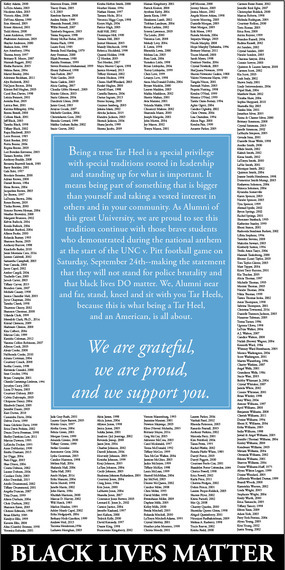 We wanted to reach out so those students felt supported, and also to continue the conversation through a full-page ad, with over 525 names of former Student Body Presidents, past Black Student Movement Presidents, athletes, activists, campus leaders, doctors, lawyers, teachers, North Carolinians, and others, which ran in the campus newspaper, The Daily Tar Heel. The University is a crucible for learning and these students should not be dismissed as impulsive kids. They are young adults and are on their way to becoming leaders in their communities, the state, and the country. North Carolina is an amazing state that has experienced a number of ideological challenges and fundamental shifts over the years, some of which have been quite damaging to its reputation. Need I remind you how harmful the actions of HB2 have been for the state's image and economy? I don't know what kind of experience Republican Gov. McCrory (also a former mayor of Charlotte) had at Catawba College, but I'd imagine the conservatism he is exerting on the state today was cultivated back then through the freedom of self-expression and growth, which is his right. Yet while he, and others, might write this off as more liberalism at the state's flagship institution for higher learning, these students' right to their expression must not be stifled. These students remind us the important lesson that when we isolate, segregate, and diminish the lives of others, it devalues the state, and devalues our shared humanity. The state motto of North Carolina is: Esse Quai Videri, which means, "To be, rather than to seem." These students show that if you want to be about something, if you want to truly be patriotic instead of just seeming so, this is one of the ways to do just that. To those who would say, "Don't encourage them!" - That's exactly what we do when we see our students rightfully expressing themselves and standing for what they believe in. To those who would say, "This is unpatriotic!" - Few things are more American than expressing one's self and standing up for their fellow man. Students have expressed that it's not about disrespecting the anthem, but respecting the loss of life. To those who would say, "This is not what a Tar Heel would do!" - Student expression and activism is one of the things that makes Chapel Hill so great and what develops great leaders for the state and the world. To be clear, these students matter, their votes matter, their voices matter. It is our goal to support these students, and if invited to do so, extend our support and experience as they continue to pursue social justice. 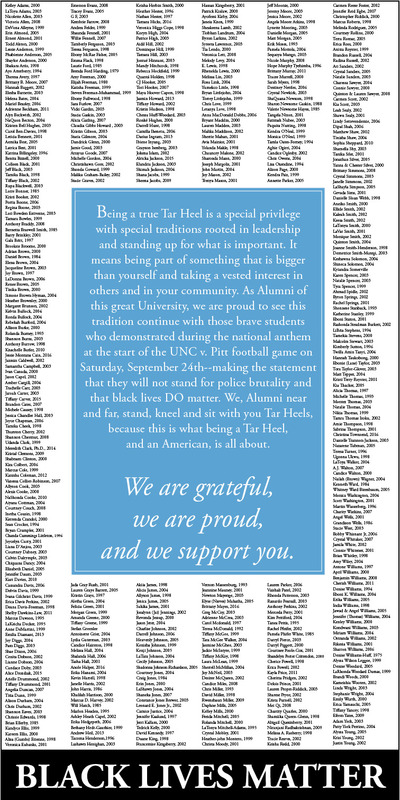 I signed on because I feel the ad evokes Carolina pride in a way that ignites emotion that should bring all Tar Heels - of all races, all ages, backgrounds, and nationalities - to rally behind what these students are about, and recognize that at its core, this statement is about the loss of black lives, and we should be doing something about it.